So the final Rural piece for the exhibition – and with the rapid execution of this piece a massive relief fell over me as I realised I had time enough after this to complete the final Urban piece and so have an exhibition. Its one of those views you see and have to capture. 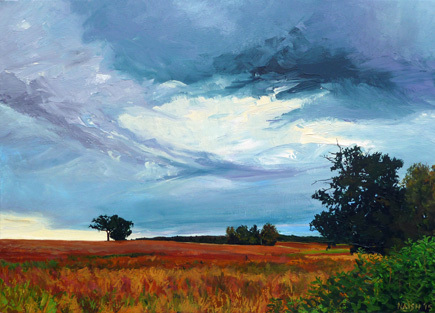 The whether was changing and even with the troubled sky the warm colours in the landscape were inspiring. I was very pleased with the compositional balance after initial misgivings at leaving the left hand tree so far into the piece. Sometimes these slight tensions add to the atmosphere. Hope you like it – its certainly one of my favourites.